“Masanobu Fukuoka (1913- 2008) was a Japanese farmer and philosopher who had a huge influence on the permaculture movement worldwide. He developed the theory and practice of ‘A Natural Way of Farming’ that involved minimum intervention from the farmer, and no-till, no-herbicide grain cultivationmethods traditional to many indigenous cultures. He wrote the ever popular seminal book The One Straw Revolution in 1975. It is a manifesto about farming, food, and a radical challenge to the global systems we rely on for our food. You can download it for free at that link. 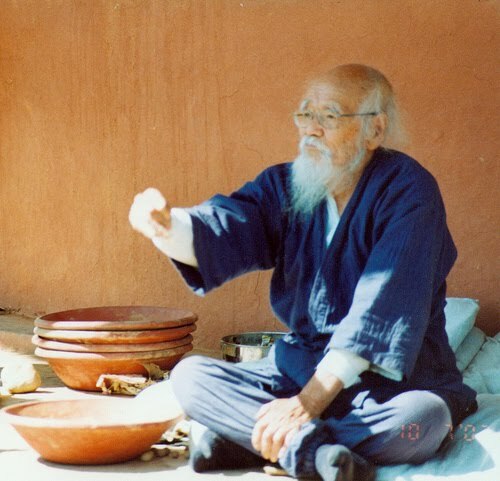 From 1979 he travelled the world widely, spreading his philosophy and techniques, and began to apply them to re-greening desert area all over the world. He also re-invented and advanced the use of clay seed balls. His work took him beyond framing and he became an early pioneer of whole foods and a more natural lifestyle. This is a short documentary that introduces Fukuoka and his radical, pioneering ideas that permaculturists are still experimenting with worldwide. Here’s a picture of Bill Mollison and Masanobu Fukuoka. Here’s a picture of Bill Mollison, the guy behind the idea, and another amazing human being who was one of Bill’s inspirations, Masanobu Fukuoka.